Personalized Golf Emblem Plaque - - personalized address plaque identifies you as a passionate golfer. Holds one line or two lines of personalization. Made for you in the USA. Line 1 holds up to ten (10) 1.25" characters. Note: Character size varies from 3" to 1.25" depending on the number of characters. For example, if you enter just five characters, the size will be 3". Optional Line 2 holds up to five (5) 3" characters when you select a 2-line sign. 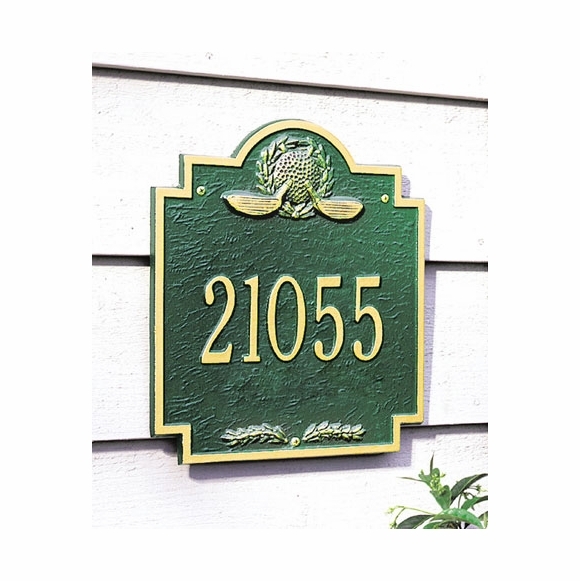 Golf emblem address plaque holds one line or two lines of personalization.